Step inside a world of imagination and new ideas with the Our Generation School Room. This cosy classroom is the perfect environment for learning. The Our Generation School Room is just like a real school. The alphabet runs around the top of the walls to help students with their writing, while a working clock and ringing bell let your dolls know when it’s lunchtime. There’s even a light up whiteboard and a chalkboard, so you can write up today’s lessons for your pupils. Encouraging curiosity, kindness, and respect for the environment is so important in the Our Generation School Room. Here, you’ll find a potted plant, recycling bin for separating waste, an attendance and a good behaviour sheet for teacher’s records, and stickers and a certificate of achievement to reward students who make a special effort. The Our Generation School Room has shelving and storage bins for all the classroom bits and bobs, from copybooks to crayons. This classroom comes with all kinds of stationery, inluding a real highlighter, a geometry kit, a calculator, pens and a stapler. It even has 2 pencil cases, so your dolls can stay organised. The doors of the school room close over to show a handsome red brick exterior, the perfect centrepiece for imaginary schoolyard play. 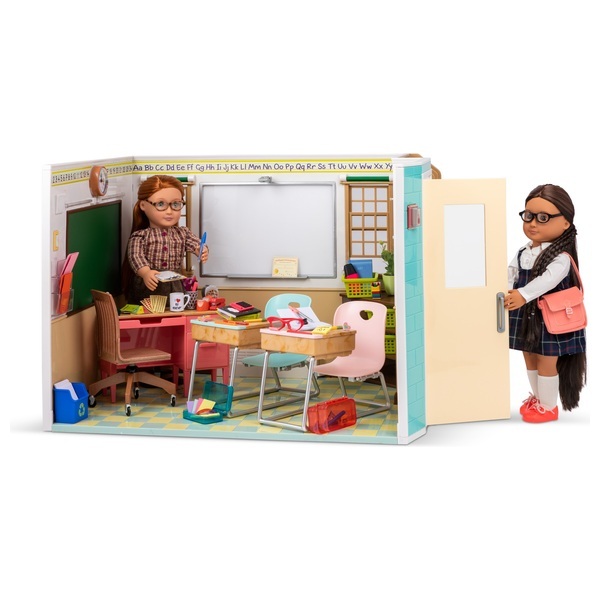 The Our Generation School Room is the perfect classroom for 45cm dolls. Dolls, personal accessories and outfits sold separately. NOTE: Please ensure that you have set the item up on a flat surface (not carpet or tiles) and that the black circuit pieces on the base of the side pieces are lined up with the circuit pieces on the base unit. If the above does not work, please unscrew the base (underside of the floor) and make sure that the 4 circuit boards are intact. EU Warning: Not suitable for children under the age of 3 years due to small parts which could cause a choking hazard. Please make sure that you have set it up on a flat surface (not carpet or tiles).